A cuddly toy of your snow leopard. A factbook all about the snow leopard along with bookmarks and stickers too. Two exclusive magazines: WWF’s ‘Wild World’ and ‘My Snow Leopard” with news and updates for your adopted animal. Snow leopard’s are quiet creatures that are happy to spend time alone when hunting. They are amazing athletes, and can jump up to 15 metres in one bound! They have a big habitat to mark out as they hunt in up to 1,000 square km, and love to travel under the moonlight to new destinations to hunt. The number of snow leopards in the wild is down to less than 4,000. The snow leopard is one of the most beautiful creatures on the planet – to lose them to extinction would be a real travesty to the world’s animal population. Snow leopard’s live a solitary life, choosing to hunt and travel alone. They only come together during the breeding season. The bottoms of their paws are covered in fur to protect them from the snowy terrain they call home. Their coat becomes lighter in the winter to blend in easier with the freshly fallen snow, making them even more difficult to spot against the barren landscape. Mostly nocturnal, the snow leopard can travel up to 40km by the cover of night as they need an area of 1,000 square km to find enough prey to live on. You may have trouble seeing me in my natural snow covered habitat, as I blend into my surroundings so well. I have to be on my guard as my soft grey coat is highly prized by poachers, meaning there are less than 4,000 of us left in the wild. My food sources are running low because humans are destroying the places where I live and hunt. I’m now an endangered species and really need your help to survive, so please adopt me and give me a chance to see another winter. A snow leopard spends most of their days resting and recovering from a hard night of hunting and foraging. They will den up or find a comfortable warm rock to sleep over, from a position that commands good views over the nearby terrain for safety. Days are by far the easiest and most relaxing part of snow leopard’s schedule. Snow leopards are carnivores and live in steep rocky terrains found well above tree line often where snow lies even in the summer months. In drier climates, such as desert terrains, they can survive off the moisture found in its prey, rather than require a natural source of water. 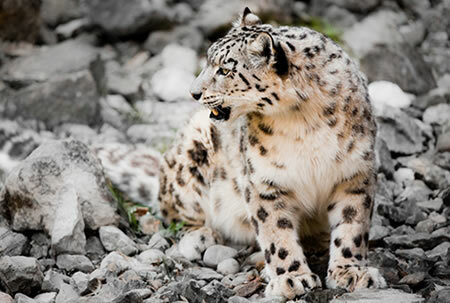 They prefer to attack from high, leaping down on their prey, with a swift bite to the back of the neck but unfortunately though many of the snow leopard’s hunts will end without a kill. Despite this and due to large reserves of stamina, they can survive for upwards of two weeks in-between meals. It is because the snow leopard is at the top of the food chain that in its natural habitat it is relaxed and fears no enemy. When a male and female snow leopard meets, their courtship can last upwards of eight days, but once over they will go their separate ways and likely never meet again. It is estimated that only fifty-percent of the adult male population may be able to find a mate during the year. Cubs are born between ninety and one-hundred days following courtship and the female snow leopard will spend lots of time looking after and nestling the cubs so they can grow stronger. It is traumatic for the mother that will need to find food for her cubs, but with no-one to look after the cubs while she is away, she is unable to stray too far from the den. Because of the needs of her cubs, she will need to find fifty-percent more food than she would normally need to gather, and due to these hardships, she and her cubs may not survive because of this. I can purr but I can’t roar. I have a short powerful neck good for dragging prey with my jaws. Because my throat and vocal parts are not very long, I can growl, mew, hiss, chuff, wail and purr, but I can’t roar. I’m made just right for living in the high mountains where the air is very thin and cold, there isn’t much for me to eat, and sometimes there is no water for me to drink. I drag my food out of the way so I can enjoy it alone. My feet are broad and velvet-furred on the bottom so I can walk and run on snow. The fur on my feet also helps me keep my footing on icy rocks as I climb. My plump tail, longer than my body, is the longest by proportion of any large cat. It is plush with stored fat and helps me keep my balance as I jump and run along ledges. It has another use, too. When I rest and sleep, I wrap my tail around me, and use it to cover my face so my nose stays warm. My nickname is “ghost cat” because my fur is such good camouflage on the snowy rocks you can’t see me when I hold still. When newborn, I have solid black spots which widen into rosettes as I grow up. When I am grown I can leap the length of a single deck bus, in one bound. I am smaller than other large cats, between 27-55 kg (60-120 lb.). My adult length is between 75-130 cm (30-50 in.) with my famous tail adding another 80-100 cm (31-39 in.) Shoulder height is about 60 cm (24 in.). 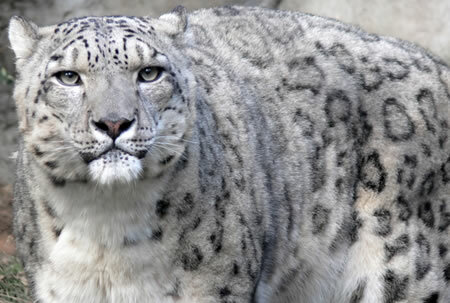 Even though I am able to bring down prey four times larger than me, there is no recorded snow leopard attack on a human. Did you know I am cousin to a tiger? Although I am native to high snowy mountains in Central Asia, I am genetically closest to the Panthera group including tigers. We snow leopards have plush thick tan or grey coats with black spots and dense whitish fur underneath from chin to groin. We are stocky with strong somewhat shorter front legs, well-developed chest muscles for climbing and slightly longer back legs for leaping. My blunt muzzle draws air through large sinus cavities for warming from sub-zero before delivery to altitude-stressed lungs. My small furry ears are rounded to prevent frostbite. My pale grey-green eyes have keen vision in dusk and dawn when prey is most vulnerable. The world’s Snow Leopard populations are under threat as the natural habitat in which they live comes under attack from competition and conflict between farmers that wish to graze their animals on the land the Snow Leopard depends upon for its food and exercise. Snow leopards live solitary lives in vast unpopulated regions at the top of a fairly pure food chain on the roof of the world. For many years it seemed that nothing would endanger their species. Red Listed by the International Union for Conservation of Nature, their only predator is man. Conflict and competition over grazing have come from herders. Domestic herds deplete tiny plants and sparse grasses which the snow leopard’s food supply needs. Overgrazing by human livestock drives away wild sheep, boars and ibex. Humans also supplement their diets with birds and marmots, hares and land birds the leopards use for food. When the snow leopard supplements his failing diet with domestic prey, he is subject to herder revenge. Confronted, he doesn’t run, relinquishes his kill, and is easy prey for a trap or a gun. Any predation on flocks is a serious loss to impoverished herdsmen whose average income is a few hundred dollars. Besides revenge, snow leopards die by fur poachers and also are sold in parts to illegal dealers who substitute whiskers and bones, very similar to a tiger’s, for traditional Chinese medicines. Recently, coal, gold, copper and silver mining in the mountains brought mechanized habitat destruction, deep pits, blasting damage to watercourses and pollution by arsenic, acids, petrochemicals and other toxins. Conservation efforts support the animal’s physical needs and also address the economic needs of impoverished human neighbours. Increasing herd health and herder income from other sources while protecting snow leopards from poaching, range and prey loss requires equity and common action across borders to achieve sustainable solutions. What can we do to help the snow leopards? Overgrazing of habitat and depletion of free-ranging prey bring snow leopards into direct competition with humans. How can we help? Adopt a snow leopard as part of an animal rights campaign. Support animal adoption movements featuring snow leopards. Some animal adoption opportunities are as local as your nearest zoo, while others invite your support on national and international levels through online initiatives, virtual adoptions, and social network campaigns. To adopt a snow leopard is to adopt our planet itself. Snow Leopards (Uncia uncia) live high in the mountain ranges of Central and Southern Asia, typically at altitudes above four or five thousand metres, ranging in the north from Russia and Mongolia down through China and Tibet into the Himalayan regions of Afghanistan, Pakistan and India. The snow leopard has adapted remarkably to its extreme environment to become one of the most specialised of all land predators. Although the total area of its range is extremely large the actual areas in which the cat is found are relatively small and notably fragmented. In addition to the thick coat which protects them against the cold and large furry paws that allow them to tread comfortably over snow, they have a large thick tail which provides a balancing role over hilly ground, and may be curled up against the face in cold weather. Snow Leopards can leap further than any other cat, reaching distances of well over forty feet in a single bound. Extremely strong and agile, they are capable of preying upon animals three times their own size. Their main prey is that of wild sheep such as Bharal (Blue Sheep) and Argali, goats, including Markhor and Ibex. Other prey taken includes Musk Deer, marmots as well as various species of hare and birds. The inaccessibility of their geographic range means that limited research has been done over these reclusive and solitary felines in nature, and they have seldom been captured on film in the wild. Fortunately their remote location has also enabled the cats to return from near extinction in recent times and evade poachers who treasure the leopards’ beautiful fur coat. Because of the inaccessibility of much of the snow leopards habitat the exact numbers left in the wild is unknown, but some estimates place the figure as low as 4,500 to 5000. The decline in population has, in the past, been mainly due to the snow leopards much sought after fur and although the animal is protected in most areas, local hunting and trapping still remains a threat. As with the Tiger, the snow leopard is still hunted for its bones, which are commonly used in many Chinese medicines and this, along with the enforced decline of many of the cats larger prey species, places continuing pressure on the remaining numbers of snow leopard left in the wild. Because of this, the snow leopard is listed in the IUCN’s Red List of Threatened Animals as Endangered and it is probable that without continuing action by many of the world’s conservation organisations they may become extinct in the wild. Despite the many adversities, the beautiful Snow Leopard is still hanging on, but only just! 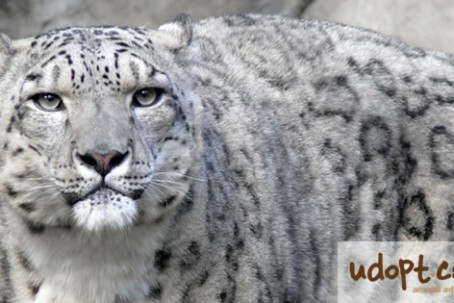 Help support wildlife conservation and adopt a snow leopard today. Snow Leopard (Panthera uncia / Uncia uncia) – Central Asia.